The Hartford Gold Group is a Los Angeles family-owned business providing Gold and other Precious Metals IRAs. It created their Gold IRA accounts to help investors achieve greater security for their retirement. Hartford Gold Group specializes in Gold and Silver IRAs and buying and selling gold and silver for physical possession. It uses a three-step process for acquiring precious metals for physical delivery, Gold IRAs or a bullion-backed Gold IRA. Gold IRAs are useful for diversifying retirement savings in a tax-deferred account. Experts at The Hartford Gold Group assist consumers throughout the precious metals buying and selling process. The company delivers quality customer service, industry experts, extensive historical investment data and current market research. The Hartford Gold Group uses a three-step process to simplify and set up a Gold IRA. To open a Gold IRA, submit the form provided on The Hartford Gold Group website or call the number provided on the site. A Product Specialist will assist you in completing the paperwork to open a self-directed IRA, which is required for this type of retirement savings account. Next, initiate a Gold IRA rollover or funds transfer to the new IRA. You can transfer many types of retirement savings accounts to a Hartford Gold Group Precious Metals IRA, such as traditional and Roth IRAs, a 401(K), a 403(B) among others. Once you fund the Gold IRA, speak to an account executive at The Hartford Gold Group for guidance selecting IRS-approved precious metals for your account. You can buy gold, silver, platinum or palladium. You can liquidate a Precious Metals IRA after the age of 59.5 years and either cash-out or take possession of the physical metals. The Hartford Gold Group recommends holding precious metals for at least five to ten years. American Eagle Gold Coin Minted only with gold mined in the U.S.; easiest to buy and sell in the U.S.
American Buffalo Gold Coin 24 karat, purest gold coin from the U.S. Mint. Carries a face value but trades at a higher value. Canadian Maple Leaf Gold Coin At .99999 purity, contains virtually no base metal. Gold mined in Canada. 1 oz. Gold Bar Includes MintMark SI security feature to prevent counterfeiting. Valcambi CombiBar Gold or Silver Bar Manufactured with breaking points and can be divided with 50 or 20 divisions per ounce. American Eagle Silver Coin The only silver coin allowed in IRA accounts, $1 face value, trades higher based on silver content. Canadian Maple Leaf Silver Coin 99.99% pure silver, holds face value for transactions but typically valued much higher for investment. 10 oz. Silver Bar .999 pure, various designs available from a variety of approved mints. The Hartford Gold Group does not charge fees to set up a Gold IRA or rollover a retirement account to a Gold or Precious Metals IRA. Shipping precious metals to the depository is always free and includes insurance and tracking. The Hartford Gold Group provides no specific pricing information for account maintenance fees on the company website. Gold IRA storage fees are often waived for up to three years or longer depending on the size of the Gold IRA account and the number of precious metals being stored. The Hartford Gold Group does not have a minimum Gold IRA contribution amount. You may find promotions on The Hartford Gold Group website, like $2,500 in free silver and three years with no account maintenance fees. Since Gold IRAs hold physical precious metals, the bars, coins or bullion are stored in an IRS-approved depository. The Hartford Gold Group recommends using a widely-known depository such as Brinks Global Services or Delaware Depository Service Company. You can elect to keep your precious metals segregated from others stored at the depository. Depositories charge a storage fee. Storage costs we found through research average around $75 per year but could be more or less depending on the value of your gold. Not all Gold IRA companies offer a buyback plan, but Hartford Gold Group does. The BuyBack Commitment provides a way for customers to sell their precious metals while avoiding additional fees for the fast three-step liquidation process. Hartford Gold Group arranges for the shipment of the gold or other precious metals then issues a payment. Check with your account executive to see if you can take advantage of the BuyBack Commitment. If you are eligible, you can save money on fees with added convenience. You are always welcome to call to ask questions, use the online chat to communicate with a representative or complete a brief form on the website to receive a free investment guide via email. The guide has answers to common questions about purchasing precious metals and establishing a Gold IRA. The Hartford Gold Group is a trusted leader in the precious metals and Gold IRA industry receiving an “A” rating from the nonprofit Business Consumer Alliance. It is accredited on the Better Business Bureau website, where it has an “A+” rating. ConsumerAffairs also accredits the company and customer reviews average 4.7 out of 5 stars. The Hartford Gold Group has a 5-star Trustpilot rating and a 9.6 out of 10 TrustScore rating based on customer reviews. The majority of complaints we saw against The Hartford Gold Group revolved around the fluctuating prices of precious metals and not the company itself. Do I own the physical precious metals in a Hartford Gold Group IRA? Yes, when you open a Gold IRA or buy and store the precious metals, you own the actual metals in their physical forms, such as bullion, coins or bars. Can I contribute toward a Hartford Gold Group Precious Metals IRA as I would any other IRA? Yes, you can purchase more gold or other precious metals at any time from The Hartford Gold Group to contribute to your IRA. Speak to your account executive or a product specialist to learn about annual contribution limits. How will I know if my Gold IRA is performing well at The Hartford Gold Group? You will receive timely, accurate information about your Gold IRA performance by talking with an account executive or product specialist. 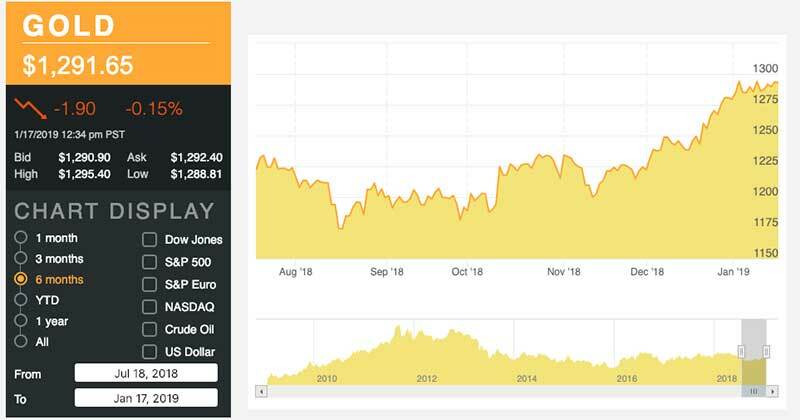 You also receive regular account value statements and can view real-time gold, silver and platinum price charts on The Hartford Gold Group’s website. What are the tax advantages to The Hartford Gold Group’s Gold IRA? You can invest in precious metals in a Gold IRA using pre-tax or tax-deductible funds. Gold IRA gains grow tax-free, and consumers can make withdrawals from a Gold IRA without penalties at 59.5 years of age, only paying taxes on the amount withdrawn. Roth Gold IRAs are available and use post-tax dollars with no additional taxes paid upon withdrawal. Is there a set time frame for taking distributions from a Gold IRA? IRAs all have required minimum distribution rules, and these rules apply to Gold IRAs. The IRS requires you to withdraw a minimum amount each year from a Gold IRA when you reach the age of 70.5 years. The Hartford Gold Group website has an easy-to-use tool for estimating your minimum distribution requirement. Sound retirement planning is essential for a secure economic future. The Hartford Gold Group strives to lead clients to financial well-being by diversifying assets with Gold IRAs. The company is well positioned to inform consumers about the benefits of investing in precious metals with industry-leading experts and quality customer support. If you are interested in contacting The Hartford Gold Group, you can call 877-672-6779.